If you are in the market for a lift chair, then you might be a little overwhelmed by the many choices and different models of lift chairs available. However, if you know a little bit about lift chairs and how they work, it is very easy to find a lift chair that will safely fit your needs and requirements, without breaking the bank. This Lift Chair Resource Guide will help familiarize you with lift chairs, so you can make an informed purchasing decision. Click on one of the links below to jump to the question or simply scroll down. What is the Lifting System? What are the Different Types of Lift Chairs? What Size Lift Chair is Right for Me? What Type of Fabric Should I Get? What do all these Measurements Mean? What Are Some Common Lift Chair Manufacturers? A lift chair is used to raise its occupant safely into a standing position. 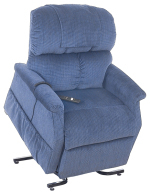 They have been around for over twenty years and today are generally priced comparably to a regular recliner. However, lift chairs offer many extra features and improved functionality when compared to a traditional recliner, most notably that they allow for an individual to stand on their own without assistance. In addition to making the standing process easier and safer, lift chairs also recline, depending on the model some do so fully, and offer an extendable footrest. However, unlike a regular sitting chair, the backrest and footrest on a lift chair are controlled by an electric motor. This is something that helps to greatly improve the comfort of the chair and the ability to find a comfortable sitting position. Modern lift chairs use a strong lifting mechanism that is installed into the base of the chair. This is used to raise the chair, with its occupant, into the air. Once the lift chair is fully raised, the user can exit the chair safely on their feet. Always make certain that the chair you are looking to purchase uses an electrical lifting system, because there are some models that use springs instead. The spring chairs work much like a catapult and once they begin moving, they can not be stopped. Due to high numbers of injuries associated with these chairs, all reputable manufacturers stopped making these types of chairs many years ago. However, sometimes you will still find a company selling these types of lift chairs though, so make sure the dealer specifically states that it has an electrically controlled lifting mechanism. Aside from the much increased risk of injury that is associated with these chairs, spring loaded lift chairs are not covered at all by Medicare. Since spring lift chairs aren’t electronically powered, the backrest and footrest is controlled by the users own body weight, which is another major downside to these spring lift chairs. 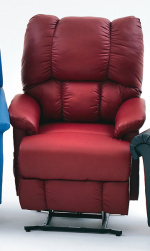 Aside from the lifting system, lift chairs are generally classified by the degree that the chair can recline. Two types of chairs are able to recline almost completely horizontally. These chairs are called 3 position lift chairs and infinite position lift chairs. The main difference between these types of chairs is that the infinite position chairs allow the footrest to be controlled separately from the backrest. Infinite position lift chairs also are more likely to have extra comfort features built in, like heat and massage, and recline slightly farther than a three position lift chair. The other category of lift chairs are called 2 position lift chairs. These chairs recline about forty-five degrees and are often called TV recliners, because they are very comfortable for watching TV or reading. Since these chairs do not recline all the way, they are not as well suited to sleeping though. It is very important to know the weight and height of the person or persons who will be using the chair. Most can support over 300 pounds of weight, but some are available that can support more than 500 pounds. 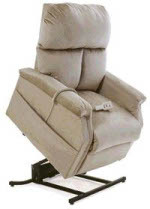 Generally chairs that support over 400 pounds are called bariatric lift chairs and have dual motors. The height of the chairs occupant is of particular importance, because the distance that the chair lifts off of the ground is based off of the height of its intended user. That is to say that a lift chair designed for someone who is over six feet tall will lift higher into the air then one that is designed for someone who is 5 feet tall. Most dealers post a lift chairs dimensions capacities on their websites. Today lift chairs come in a wide variety of colors, designs, and styles. The type of fabric that the lift chair has is not strictly aesthetic. Some fabrics are softer, more durable, or stain resistant. The breathability of a fabric is another important consideration, because having a highly breathable fabric will help prevent the fabric from becoming too hot and sticky. Usually a lift chair will come with a set of fabrics that the buyer can choose from. The dealer will then offer a wide selection of fabrics that the buyer can upgrade to as well. There are two main lift chair manufacturers, Golden Technologies and Pride Mobility, who both have their own upgraded fabric options. Golden Lift Chairs have several upgraded fabrics, like Bronco Vinyl, suede, and Brissa. Brissa is a extremely comfortable synthetic leather. However, unlike most leathers, Brissa is extremely breathable, so you do not get the same sticky feeling that is often customary of leather. Pride Lift Chairs also have their own upgraded fabric options. They offer several vinyls, suedes, and fine leathers. They also offer a fabric called Promessa, which is highly resistant to temperature change and very breathable. Like Brissa, even the toughest stains can be cleaned from Promessa using only a little bit of warm water and soap. Some chairs come with these upgraded fabrics standard, such as the chairs of Golden’s Designer Series, come with these Brissa standard. Many lift chairs offer heat and massage built into the chair. These can improve comfort and help increase blood flow. A battery backup is usually included in most chairs as well, which uses a single nine volt battery. Some chairs also have storage compartments built into the armrests. There are also several chairs that address specific customer needs. This includes chairs that have removable armrests, which allow for easier transfers into and out of the chair. Wall hugger lift chairs are also popular, which can be closed very closely to the wall, while still completely reclining. These are great for places where space is very limited. Most manufacturers offer a number of different measurements, such as seat depth and seat width. Visit our Lift Chair Measurement Guide to learn what these measurements mean.